The breakfast invention today was really a last minute decision. Some days are like that, I look at my fridge and the thing I planned doesn't sound quite perfect. Voila! a container of pumpkin awaited - I've been using it in yogurt and smoothies this last week, and the rest needs to be frozen. 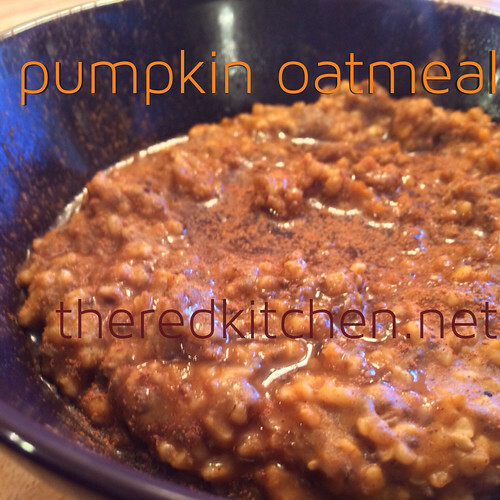 So I whipped up this healthy and hearty oatmeal recipe. The pumpkin and spices really give a warm flavor, and the chia seeds make it nice and thick. Then the honey at the end gives a touch of sweet, and you can adjust how much you use for your preferred sweetness level. 1 cup liquid - I used 1/2 cup Almond Milk (Almond Breeze's Unsweetened variety) and 1/2 cup of cold tea. 1/2 cup pumpkin - pure pumpkin purée, not the pumpkin pie filling with extra additives! Bring liquid to a boil. Add oatmeal and stir. Add pumpkin, chia seeds, and spices. Bring to a boil and then turn down the heat to simmer for 20 minutes, stirring often. Serve with honey and another sprinkling of cinnamon on top. Enjoy!